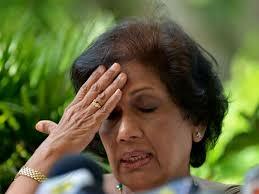 Former President Chandrika Kumaratunga, the Chairperson of the Office for National Unity and Reconciliation, said women who were widowed during the 37-year conflict were among the victims of abuse by officials who frequently demand sexual favours just to carry out routine paperwork. "There is a lot of sexual abuse still going on by officials, even Tamil officials and even at lower levels, the Grama Sevakas (Village Headmen)," she told Sri Lanka's Foreign Correspondents' Association. "Even to sign a document, they abuse the women and of course some people in the (armed) forces continue to commit sexual abuse", she said. Kumaratunga, who lost an eye in a Tamil Tiger suicide bombing when she was President at the height of the conflict, said the best way to make women less vulnerable was to improve their livelihoods. "We feel that when women have livelihoods, they will be empowered... they feel safer and they don't have to be exploited," she said. Kumaratunga said many women had been traumatized as a result of the sexual abuse and needed psychological support but the authorities lacked qualified experts to treat them. "We cannot bring counsellors from abroad because they won't know the language," she said.